Librarian Emily Ford is leading a project on digital badges as part of the Provost’s Challenge of reTHINK PSU. The purpose of Digital Badges for Creativity and Critical Thinking is to procure a digital badge system, create a digital badge curriculum to certify and acknowledge skills attainment for creativity and critical thinking, and deploy this curriculum for a subset of undergraduate students in Community Health. 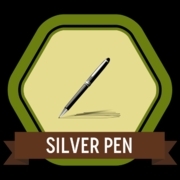 The Silver Pen, one of the badges students receive as they complete work in this project. This fall term, more than 250 students in sections of PHE 250, PHE 327U, and PHE 354U are completing work that leads to badges. Many students have already begun the work to receive their first badge. Master Info Analyzer – culminating badge certifies completion of all badges and passing grade in the class. Information about badges are in each course syllabus and instructions about how to earn each badge are integrated into the courses’ D2L instances.